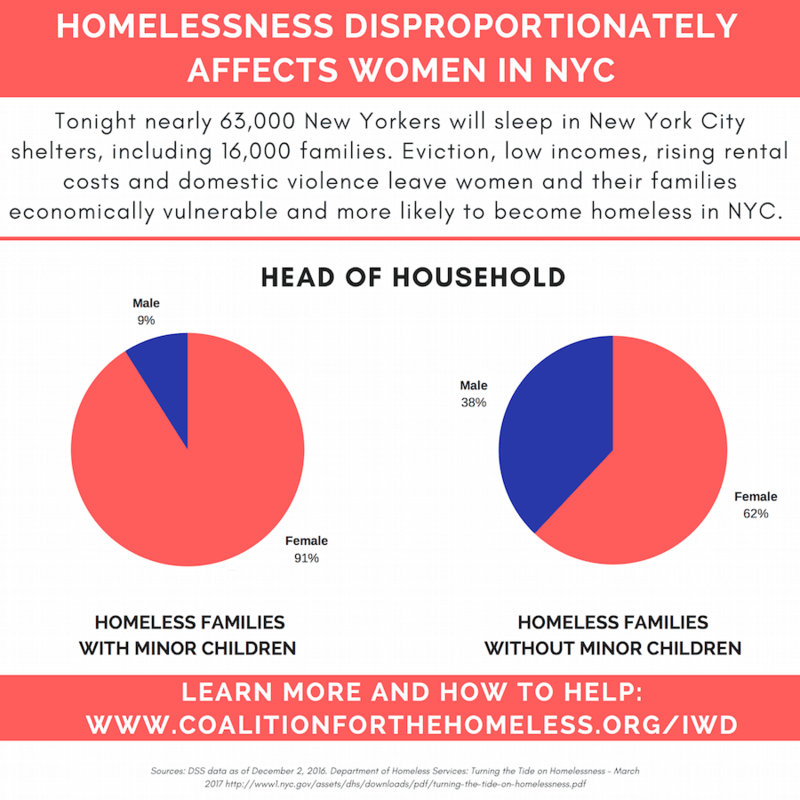 Women are disproportionately affected by homelessness in New York City. In addition to the 3,976 single adult women sleeping in NYC shelters each night, recent figures show that a staggering 91 percent of families with children in shelters and 62 percent of adult families in shelters are headed by a woman. The primary causes of family homelessness in New York City are the housing affordability crisis and domestic violence. The Coalition for the Homeless consistently advocates for housing-based solutions to homelessness, and the recent victory in securing universal access to legal counsel for all low-income tenants in housing court will significantly stem the tide of evictions that too often send women to the shelter system. However, much more work remains in addressing the homelessness crisis that affects thousands of New York women every day. 1. Donate to the Coalition. We help 3,500 homeless people per day through our 11 direct service programs. Our First Step Job Training Program helps homeless and low-income women gain both the hard skills and self-confidence needed to obtain living-wage employment through 14 weeks of classes, workshops and internships. 2. Attend the Women Mean Business Luncheon on April 25th to celebrate the achievements of the resilient First Step participants and raise funds for this life-changing program. 3. Volunteer as a First Step job coach or donate your gently used professional clothing to the First Step Boutique. Email info@cfthomeless.org for details. 4. Urge Governor Cuomo to implement Home Stability Support, a bold proposal by Assemblymember Andrew Hevesi to establish a statewide rent subsidy program for public assistance families and individuals facing eviction, homelessness or loss of housing due to domestic violence or hazardous conditions. This proposal would enable more women and their families to get and remain stably housed rather than endure homelessness. 5. Share this graphic on Twitter and Facebook to spread the word about homelessness’ impact on women and their families.